The Jubilee Football Competition in Region Eight, which was launched earlier this week under the guidance of the Regional Democratic Council, will get cracking today in Mahdia. 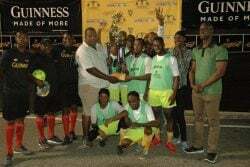 The competition will be played under floodlights and Minister of Communities, Ronald Bulkan is expected to witness the opening ceremony. The competition will be coordinated by the Pakaraimas Sports Association (PSA) in association with a number ofpartners and is the brainchild of the region’s REO, Rafel Downes. The launching ceremony was held in the RDC’s boardroom and witnessed by Regional Executive Officer Downes, Deputy Regional Executive Officer Gavin Gounga, other senior officials of the region, representatives of the teams, sporting officials and coordinator of the competition, Harold Waqar Shiwnarain. Deputy Regional Executive Officer (DREO) for Region 8, Gavin Gounga receiving the Championship trophy from Coordinator of the competitions, Harold Waqar Shiwnarain with officials of the RDC and some teams’ representatives looking on. 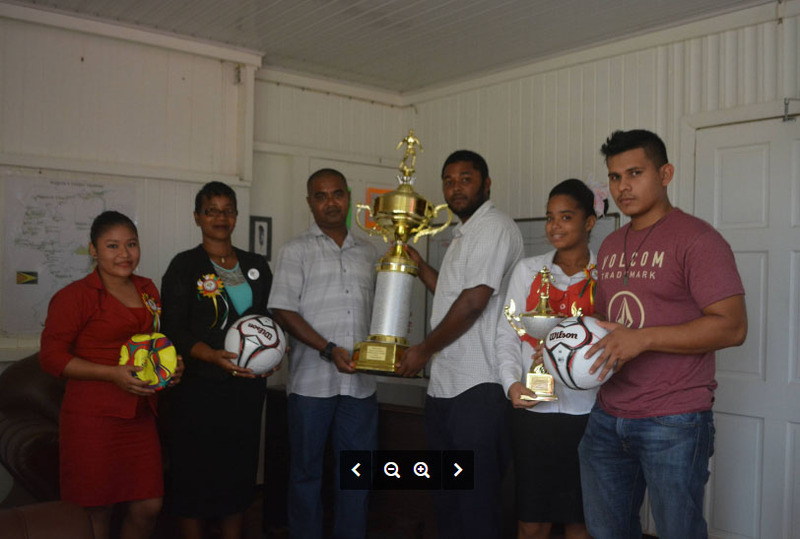 The REO said that while football remains a passion among the youths of the region over the years they have faced challenges in having competitions. This, he noted, is a result of the fact that traversing most parts of the region requires air transport and this has been very difficult for teams and sponsors. He said that the region needs support and assistance in taking sports to another level as while the youths are motivated to get involved, they are unable to bear the financial burdens. The final of the competition will be played under floodlights and, prior to the final, the domino and cricket competition finals will be played. The football competition is open to teams around Mahdia and a similar competition will be held for teams in the Kato community. 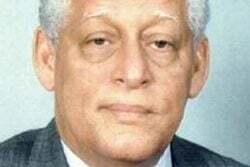 Waqar said that with significant support and assistance from the REO they have been having in-depth discussions with the various clubs in Region 8 geared towards forming a sub association as they seek membership within the GFF. He pointed out that this will help in providing a level playing field for talented and skillful players within the region to make their way onto the national team. A similar approach is being taken in Region 9, he said, adding that the Hinterland Games will see the realization of the Hinterland Sub Association. 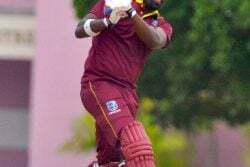 “We think it’s time that players from the hinterland community get an equal opportunity to play for Guyana as the hinterland regions all forms part of Guyana,” he said. “I must say that many of the teams are very excited and upbeat with the significant interest being shown in developing sports within the region by our REO, Rafel Downes and with the aggressive approach he has been making in terms of securing sporting assistance by way of equipment and other resources is indicative of his passion and determination. We are confident that with his vision and passion that becoming a member of the GFF will soon be a reality under his guidance,” Waqar stressed. The REO said that he is satisfied with the progress being made thus far in making sports an integral part of the various communities within the region adding that with the various relationships that he is seeking to forge ahead with Region 9 and other hinterland communities he is of the view that sport development will be boosted. Downes reminded those in attendance that he is steadfastly committed in his passion for sports for the region stressing that sports can help with holistic growth and development. He disclosed that while there remains some evident challenges in a number of areas within the region taking sports to another level will certainly help in boosting the region and its people. Downes said that he is enthusiastic about sports in general and seeing the excitement and passion on the faces of members of the various communities whenever there is an opportunity to engage the various villages in sporting activities continues to motivate him to assist in a major way. The REO issued a passionate appeal to the corporate community to assist in whatever way that they can in bringing about sporting development. “Sports needs more than that passion, determination, discipline and enthusiasm. It needs resources both financial and technical to grow and this is where the corporate community can help. Many of these players have raw talent but because of the lack of resources in terms of finances and equipment they are forced to abandon their passion for economic survival,” he said. Downes stressed the urgent need for youths to use sports as an avenue for both personal and community development declaring that its time the youths recognize that everything cannot be done by government thus they would need to bring out the spirit of determination and perseverance if success is to be a formula in their daily living. In praising the efforts of Waqar in organizing the events the REO said, “I must applaud Waqar who has a young and was identified through my DREO to address Sports in the region and its evident that he has been playing a crucial role in ensuring that we get moving. Everyone must come on board irrespective of one’s political persuasions as sports is bigger than anyone, political party or organization as with sports relationships are forged, communities are brought together, relationships are grounded and that is what we need for this region and hopefully through events like these as the benefits to the region and the its people are enormous. We at the RDC is very happy to be playing an integral part and is pleased to use sports as an avenue for the youths to be positively engaged,” he reiterated. Meanwhile, DREO Gavin Gounga noted that the benefits of success is enormous and has the capacity of taking the region to another level. “People love to be associated with success and once we as a region can demonstrate that we are not just a pack of individuals talking but demonstrating our worth through our performances then our argument for certain things will be justified. I want to be the DREO who can say with my REO that our region was at this level last year but this year we are here and hopefully next year we will be there, in my mind that is what you call growth,” he declared. The teams contesting the competitions for both male and female teams are Pakaraimas FC, Campbelltown FC, Micobi United and Madhia United.